EcoQuip 2 EQp - the affordable powerful abrasive blaster! Prepping a surface can be challenging and time-consuming, especially if you are removing layers of paint or other coating products that have been there for decades. Grinding, scraping, applying heat, and using chemicals are hard work because the same binders that cause paint to adhere also make it hard to remove. At the end of the day, it's about finding the best machine to get the job done quickly and with as little dust and noise as possible. This affordable option in abrasive blasting is not only easy to use, but portable enough to take from one job to another. 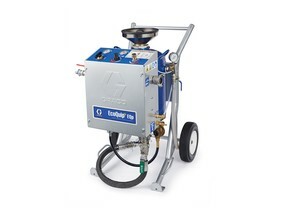 In addition, Graco's vapor abrasive blast equipment reduces dust by up to 92% less than traditional dry blasting and uses very little water, making containment and cleanup of debris simple and less messy than power washers. Click Here To See The EQP In Action! With a small footprint and built-in hand truck with over-sized wheels, the EQm is ideal for small jobsites and blasting in unconventional areas. 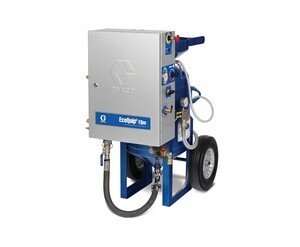 In addition, this compact blaster is capable of handling any type of project, from cleaning to surface preparation. "The other day, my manager has ordered Bolair's industrial pumping systems and accessories. We are really thrilled with the high quality of these products and the competent attitude of Bolair's team. Bravo!"